You have probably noticed children and teens wearing braces, or perhaps wearing Invisalign in Singapore. When teeth are corrected earlier in life, the results can be enjoyed for decades; but even if you’re an adult now, it’s not too late to get your teeth fixed. 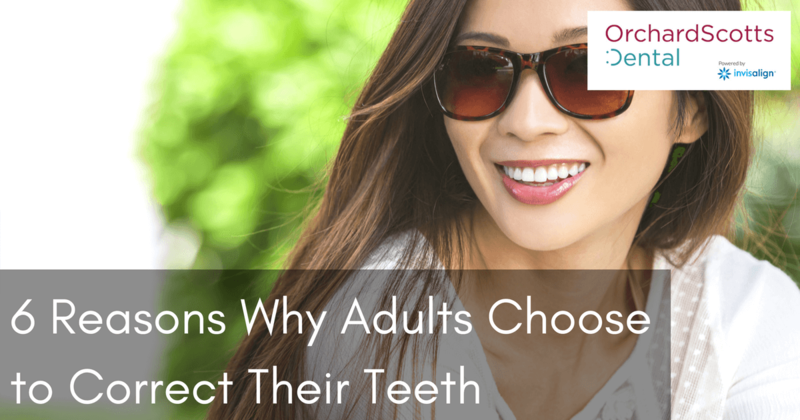 Check out of few of the popular reasons for adults choosing to correct their teeth. With Invisalign, you won’t have to deal with metal in your mouth; instead, you’ll get a clear, colourless plastic appliance that fits smoothly over your teeth and is barely visible to others. it’s a much more aesthetically pleasing look. In addition, you can take the Invisalign trays in and out for eating, so you don’t have the concern of unsightly bits of food wadded into your braces every time you eat. Perhaps when you were growing up, Invisalign in Singapore was not a very common or readily available option. Fortunately, you now have direct access to an Invisalign provider, Orchard Scotts Dental. Our dentists have helped many patients through the Invisalign process, and they’re experts in each stage of the journey. Getting your teeth corrected is expensive; but as an adult, you have access to resources and possibilities that you may not have had as a teen. You have a job, and perhaps your spouse works as well. You have access to credit, and you can take on extra side jobs to supplement your income and pay for the work on your teeth. Plus, the Invisalign cost in Singapore is not prohibitive; it’s actually comparable to the cost of braces. If you’re responsible and careful with your Invisalign trays and your oral hygiene, you can keep the costs down. Have you always struggled with a lisp or an odd accent? Perhaps you often mispronounce words or you have to shape your mouth a strange way for some sounds. Some of these occurrences may be caused by crooked teeth or a misaligned bite. With Invisalign, you can have straight, properly aligned teeth that eliminate or reduce those speech issues, allowing you to pronounce clearly for the first time. People with crooked teeth, overbites, crossbites, or underbites are often forced to chew or bite differently. Their teeth, especially the molars, do not have the correct contact points, so their entire mouth and jaw has to work harder to masticate food. This can cause longterm pain and discomfort. Your dentist in Singapore can identify such issues and lay out a treatment plan that not only gives you straight teeth, but corrects bite problems so that your jaw pain is relieved. Of course, a top reason for getting braces or Invisalign is to achieve a better smile. A great smile can give you the confidence you need in your personal or professional life. It makes you more attractive and appealing to others, whether they are colleagues, friends, family members, or potential romantic partners. Don’t wait any longer to improve your oral health! You deserve to be able to chew comfortably, speak clearly, and show off an attractive smile. Contact Orchard Scotts Dental today to arrange a consultation and start the journey towards a better smile.